A human life is not generated spontaneously; our existence is a random combination of hazy vestiges of our ancestors. The idea behind this artwork is to compress half a millennium of data about people’s lives into a single computer-generated image. Visual Genealogy shows the family tree of Mr. Park (Myrang clan, hwarok party) and reveals the cognitive meanings of a complex dataset (in this case, the data are life and death). 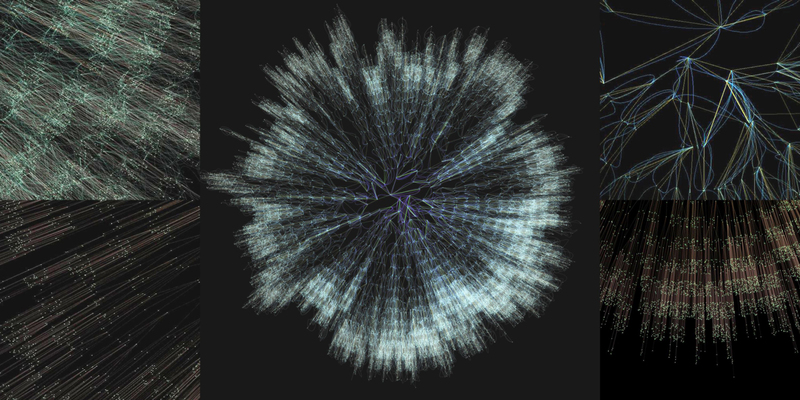 Information visualization is an interdisciplinary field that combines topics such as computer graphics and user-interface design into a cognitively plausible way of presenting information to enhance understanding. The Korean family tree, called a Jokbo, provides a unique theme for visualization study. In addition to the usual problems of information visualization, it requires display of a large database (sometimes containing over a million records). This artwork can be seen as a successful application of techniques for intuitive understanding of large datasets. The brightest node in this family tree, right in the center of the image, is one of Mr. Park’s ancestors who lived about 500 years ago. And Mr. Park himself is located at the very bottom of the picture. His grandfather and 20 generations of other descendants may never have read the Biblical sentence: “I will surely bless you and make your descendants as numerous as the stars in the sky and as the sand on the seashore.” But the ancestor at the root of this family tree would surely be glad to know that 27,404 sons and grandsons (stars) sharing his surname lived after him in his world. A preliminary form of this artwork was shown in the SIGGRAPH 2007 Art Gallery. Since then, the visualization has been completely re-programmed with more data.